Does The Deed to Your Home Agree With The Distributions in Your Will? Owning a home can be one of your most valuable assets. It is important for homeowners to understand when they buy their house how a Deed impacts the title and ownership and to whom their house passes. Joint Tenants with right of survivorship or Tenants in Common are two common titles that could appear on a Deed, each having its own meaning. Joint Tenancy with right of survivorship states that if you own the house with another person and one of you predeceases the other, the survivor will take full ownership. A Deed titled as Joint Tenancy will take precedence over having a beneficiary listed in your Will. Probate is not required for this transfer of title to take effect. However, with Tenants in Common, there is no right of survivorship. Therefore, if you own a house with another person, and one of you passes away, the deceased person’s share will pass to a beneficiary or the other owner of the property (survivor) could offer to buy the beneficiary out, but often this must go through the probate process. Making sure the Will and the Deed match are important. Without proper planning, your desires may not get met. For example, take the scenario: you and your brother own a house together- you set up your Will instructing that your ownership share of the house goes to your son when you pass, but the house is titled as Joint Tenants with right of survivorship meaning if your brother outlives you, he will have full ownership of that house and can decide who gets it after he passes. Your son may never get the house. This could leave your son with resentment if he believed he was getting the house. But what if you do not have a Will at all, then what? 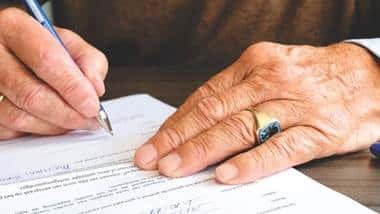 Without a Will in place, the intestate statute of the State of Florida will dictate who gets your property which is usually among your closest relatives. Again, the court will consider the Deed to decide if anyone else is listed as an owner. However, if you want your home going to or not going to a certain individual or to not be divided up, then a Will is needed, along with a Deed having the correct titling. Having a conversation with family members and any owners whose names are listed on the Deed ahead of time can help solidify your desires to be carried out. Another example, if you own your house solely in your name and once you pass you want everything going to charity, but you do not have a will in place, then the home will be distributed according to the Florida law and your spouse or children will receive ownership of the home. It is best to consult with an estate planning attorney when addressing these issues. There are many intricacies involved in making sure the title of the property gets properly transferred to whom you want it going to and it is very easy to come across bumps along the way whether it be due to how the Deed is titled or what the language states in your Will.